“How many flowers do I need for my arrangement?” This is a common question we hear from our customers and very important to understand when it comes to ordering DIY flowers. The number of flowers you need can vary depending on the size of the blooms, the number of different flowers you plan on using, and of course your personal style! A basic mixed arrangement is comprised of focal flowers, secondary flowers, filler flowers, and greens. Check out the infographic below to see what quantities you’ll need for creating an arrangement using 1 flower variety for each of those categories. Pin it for later so you have a guide to follow when you order your DIY flowers and start arranging! Keep in mind that this outlines a basic mixed arrangement, you can have as many or as little flowers as you’d like! Just remember if you plan on having a few different types of fillers, but still want a medium sized arrangement, you might need to adjust the number of secondary flowers or greens in your arrangement. Flower quantities can also vary depending on the type of bouquet or size of vase you plan on using. For example, if you plan on making a mason jar arrangement, you’ll need 10-15 stems for a medium arrangement, not the average 15-20 flowers. Check the table below to see how many flowers you need for your unique floral arrangement. 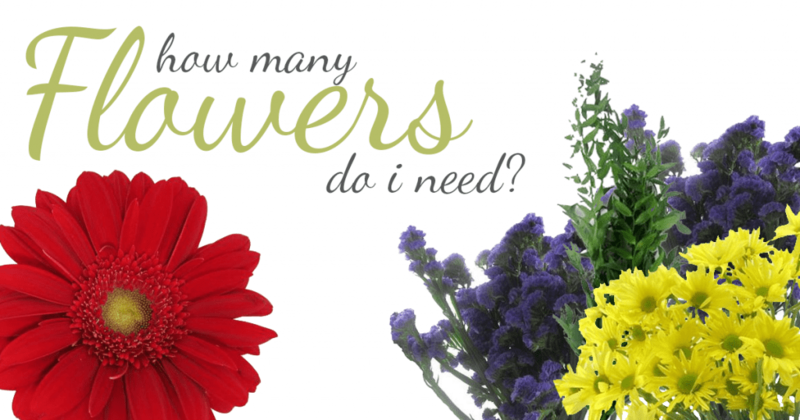 Want more flower quantities and examples? You can visit the flower quantities page on our website!